I feel honored and it is a great pleasure to present the International Hydrological Prize to my colleague and friend over the past two decades Dr. Alan Gustard, from the Center for Ecology and Hydrology (CEH), Wallingford, United Kingdom. Dr. Alan Gustard has devoted his whole scientific life to international hydrology. Dr. Alan Gustard was born in Hornchurch, Essex, 18 December 1947, UK. He graduated from the University of Lancaster in 1969 in Environmental Science. From 1969 to 1974 he continued at the University as a research scientist and then he joined the leading research Institute in Hydrology, the famous Institute of Hydrology (now CEH) at Wallingford as a senior hydrologist specializing in low flow research. In 1981 he was awarded a PhD at Lancaster University researching the hydrological response of small headwater catchments. Since joining the Institute of Hydrology he has had several different positions, being appointed senior hydrologist in 1982 responsible for water resources research in the UK and mainland Europe and leading the FRIEND (Flow Regimes from International Experimental and Network Data) project. In 1989 he was appointed head of the Flow Regimes section where he initiated research programmes in environmental flows and small hydropower and extended his experience to include work in the Mekong and Philippines. His management experience was advanced further by his appointment as Head of the Risks and Resources Division in 1994 where he was responsible for the management of over 40 staff researching low flow frequency, environmental flows and flood prediction and forecasting. He was appointed Deputy Director at Wallingford in 2000. Dr. Alan Gustard serves or has served as a member or chairman of UK and International Expert groups and Committees. The list is very long and I would therefore like to highlight only the most important ones. He is the UK representative for UNESCO’s International Hydrological Programme. He has been chairing the International FRIEND Coordinating Committee for many years which has promoted FRIEND at a global scale. He has chaired the Northern European FRIEND Steering Committee. From 1985 until 1997 he coordinated the Northern European FRIEND Low Flow Group and influenced pan European low flow research. In 1999 he was elected president of the International Surface Water Commission of IAHS. During the last 18 years Dr. Alan Gustard has been the leading scientist within the FRIEND project. FRIEND was initiated in 1985 as a project in UNESCO’s International Hydrology Programme. FRIEND is now considered to be one of the most innovative and successful UNESCO initiatives and this is reflected in its position as a crosscutting programme of IHP VI. Dr. Alan Gustard was not only involved in the inauguration of the FRIEND programme, he gave the programme a scientific vision with respect to the hydrological behavior of flow regimes at regional, continental and global scales. He has fostered and launched a worldwide FRIEND network carrying out research identified by regional FRIEND groups with a high priority given to capacity building in developing countries. His long-standing contribution to the development of international hydrological research programmes is outstanding. It has stimulated scientists from different parts of the world to liaise and to work together and exchange research knowledge and experience for the benefit of society. Dr. Alan Gustard is an excellent scientists and a dignified advocate for the scientific community and therefore deserves to be awarded the International Hydrological Prize 2003. 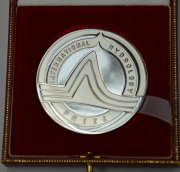 On 6th May I learnt from our President that I would be awarded the International Hydrology Prize for 2003. In equal measure I was both surprised and honoured. Surprised at being grouped with such a prestigious family of international hydrologists and honoured to receive this award from IAHS, UNESCO and WMO. I would like to briefly reflect on my early career as a hydrologist and raise some key issues regarding the science of hydrology. It is interesting to remember how each of us embarked on a career in hydrology compared with alternative choices, for example in other sciences, engineering, the arts, finance or law. Perhaps you were attracted by the unique water molecule – essential for life, and which occurs on our wonderful planet in three phases of solid, liquid and gas and transfers between these phases with ease or perhaps you were fascinated by one of the world’s largest rivers and the desire to understand the seasonal pattern of river flows, the grandeur of its floods or the desire to mitigate the impact of droughts. For many of us our motivation has come, not from the science, but from a scientist. I would particularly like to acknowledge Colin Patrick, at the time a young lecturer at Lancaster University in the UK, for enthusing me as a student about the science of hydrology, the need to question conventional wisdom and opening my eyes to an exciting career. There are many Colins in schools, colleges and universities throughout the world who motivate and enthuse others to develop a career in hydrology and we should applaud their essential role of developing the hydrological profession. Having motivated a young student, the next task is to school him or her in the art and science of hydrology and the art and skills of research. The young researcher needs a mentor who can guide the novice, instruct him how to do research, how to transfer this understanding to the user community and very occasionally, tell him he has done a good job! In this context I would like to thank Max Beran – my first supervisor at the Institute of Hydrology, where we carried out the first UK wide study to develop procedures for estimating low flow frequency at ungauged sites – primeval PUB * . Max was one of many national and international colleagues who I learnt from, argued with, accepted or rejected advice from and had the privilege of working with. I would like to thank you all. Has the climate change agenda resulted in too low a priority being given to environmental issues of a more immediate and local nature? How do we advance our research at the interfaces with meteorology, geology, ecology and socio-economics without diluting our advances in the core discipline of hydrology? How do we reduce the time taken but increase the frequency with which hydrological research is transferred to operational hydrology? Can the international community make a significant impact in building research capacity in developing countries and sustain it? Should we maintain our current entrepreneurial culture in developing global initiatives or provide a more coherent programme in International Hydrology? I look forward to debating these and other issues in Sapporo. It is a particular pleasure to receive this award in the home country of our President Kuniyoshi Takeuchi and in this the UN International Year of Freshwater. I would like to thank our President and his colleagues in the Local Organising Committee for their excellent organisation of this IUGG General Assembly and for their kind hospitality during our stay in Sapporo. I have particularly enjoyed the privilege of coordinating FRIEND. I acknowledge the scientific contribution of a large number of hydrologists in over 100 countries and their enthusiasm for the science of hydrology coupled with the desire to work across international borders. All colleagues with whom I have had the privilege of working have contributed towards this prize. Mr President, Ladies and Gentleman, I am truly honoured and thank you for this fine award.